Your opinion matters. Leave your review of Grassroots Crisis Intervention - Men's And Women's Shelter. Description: Provides free 24-hour telephone and walk-in crisis counseling, emergency shelter, transitional housing, and community education in the Central Maryland area. Also offers a mobile crisis team for psychiatric emergencies. 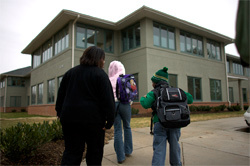 FAMILY AND WOMEN'S SHELTER: Provides 33-bed shelter for individuals or families. Provides meals, case management, individual and group counseling, supportive services and transportation. Length of stay determined on an individual case basis. MEN'S SHELTER: 18-bed shelter is available for men in need. Offers the same services as the emergency shelter. Length of stay determined on an individual case basis. COLD WEATHER SHELTER: Operates during the winter months (usually Nov-Mar). Offers overnight shelters, food and case management services. Residents must leave during daytime hours. Shelter revolves around several, faith based communities in the Columbia, MD area. 24-HOUR CRISIS INTERVENTION AND REFERRAL: Offers a hotline and walk-in counseling center for those in need of immediate assistance with a personal, situational, or mental health crisis. Services are free of charge and confidential. Certified suicide prevention center. Donation Requests by Grassroots Crisis Intervention - Men's And Women's Shelter: The shelter is in need of cleaning supplies, food items, personal hygiene items, silverware, VCR\'s, games, pens, sewing kits, tissues, paper products, cups, etc. Do you have items to donate? Contact Grassroots Crisis Intervention - Men's And Women's Shelter at the phone number provided above to see if they can use any items you may have to donate.